Passionatemae | Food has a way of bringing people together: Sea Salted Caramels with a shot of Rum! Seriously, there are SO MANY recipes out there on how to make Salted Caramels. Some uses condensed milk while others use cream. I decided to go with the condensed milk recipe! I have adapted this recipe from Bon Appetit. This recipe caught my eye a while back, but I never gotten the chance to make it. Honestly, I'm not really a Caramel kind of girl...I always find it too sweet and I hate that it sticks on my teeth when I eat them. So generally, I tend to not eat anything that has caramel. They are salty, and sweet at the same time...and of course with a light punch of Rum. Originally this recipe uses Bourbon, as I do not have any, I decided to go with Rum. If you don't want any alcohol in them, just replace it with Vanilla Extract. It is really important to ensure that you have all your ingredients and tools ready! As we are dealing with sugar! There is really no time to wait, as the temperature rises so quickly! 1) Coat an 8x8” baking pan with nonstick spray. First spray your pan, then line with parchment and spray again. Make sure to leave some parchment paper overhanging both sides - easier to pull it out later. 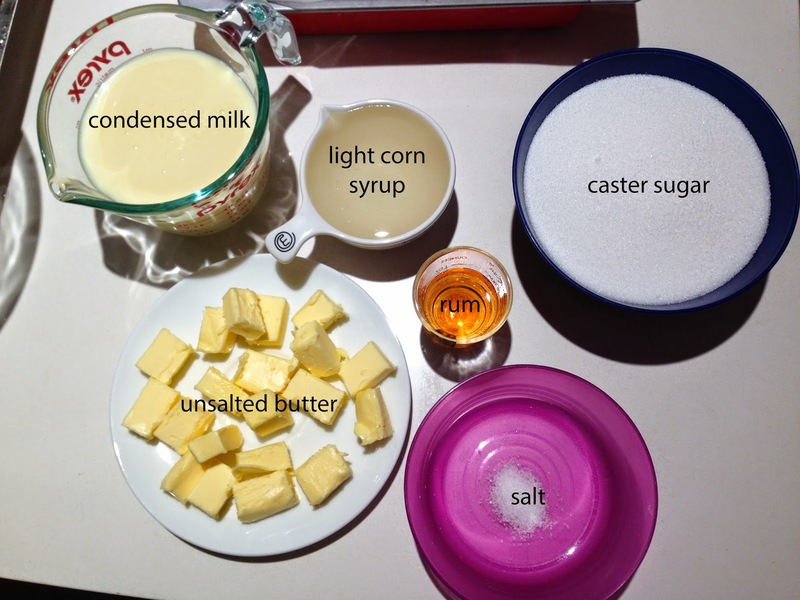 2) Bring sugar, corn syrup, and ¼ cup water to a boil in a medium saucepan over medium-high heat, stirring to dissolve sugar. Cook, swirling pan occasionally, until mixture turns a deep amber color (it took me about 14 minutes). 3) Remove pan from heat and whisk in sweetened condensed milk and butter (pour in slowly, as mixture will bubble up) mix until smooth. Use the candy thermometer to measure temperature of the mixture in the pan and return it to the heat. 4) Cook, whisking constantly, until thermometer registers 115 Celsius. 5) Remove from heat and whisk in rum and salt. Pour into prepared pan; let cool. 6) Once it is warm to touch, sprinkle caramel with sea salt. 7) Cut into the sizes you want and wrap individually in parchment paper. - You can make this 2 weeks ahead!